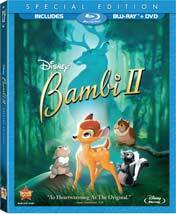 After releasing its classic animated movie Bambi on high-definition Blu-ray in March, Walt Disney Studios Home Entertainment is delivering the sequel to Blu-ray on Aug. 25. Bambi II won’t be in the studio’s Diamond line, as the original film was, but will instead be a Special Edition DVD, Blu-ray/DVD combo and movie download. The 2006 movie, which was screened in some theaters overseas but premiered on disc here, features the voice of Patrick Stewart (X-Men) as Bambi’s father, the Great Prince, and Alexander Gould (TV’s Weeds) as Bambi. In the family film, the Great Prince teaches Bambi how to survive in the forest, and Thumper the rabbit, Flower the skunk and Owl are around too. The discs and download will come with a bunch of special features, both new and exras from the earlier DVD release. The movie download will include the deleted song and the two featurettes. 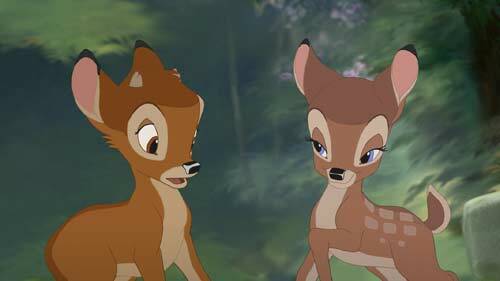 Bambi II will be priced at $29.99 on DVD and standard-definition download and $39.99 on Blu-ray/DVD (in Blu-ray and DVD packaging) and high-def download. Amazon has all disc versions available for pre-order (click on the links) and is pricing the DVD at $20.99 and the Blu-ray/DVD combo packs at $27.99 each, as of this writing.